There are many memorials in St. Augustine's Church, placed in memory of loved ones now departed. A Faculty Petition was submitted by The Rev Rosslyn Bruce on 13th May 1921 in which it was proposed that "a war memorial in the form of a column in Portland stone" be erected. 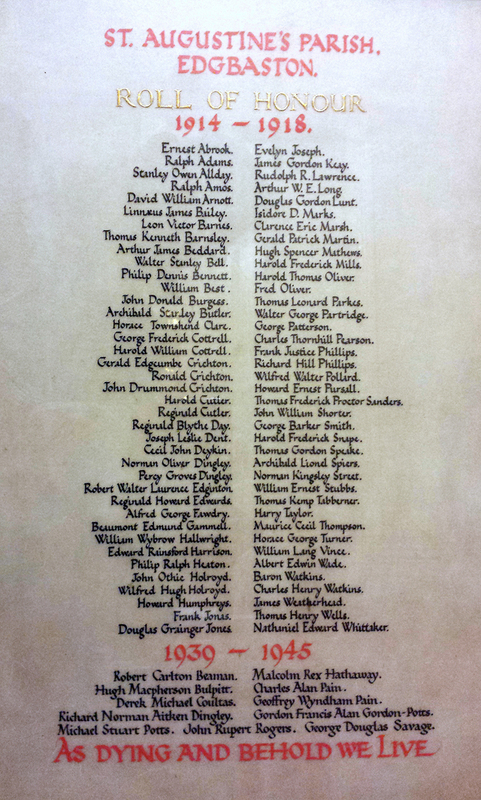 The subsequent memorial, paid for by subscriptions from parishioners, was scuplted by J. H. Morcom. (Click to read more about the sculptor and the faculty process). In 2015, Historic England confirmed that the monument had been added to the Statutory List at Grade II on the basis of Historic, Architectural and Sculptural value, as well as Group value alongside the church itself. The memorial lists all those men from the parish who were lost in the conflict 1914-1918 and subsequently had those men added who died in the Second World War. 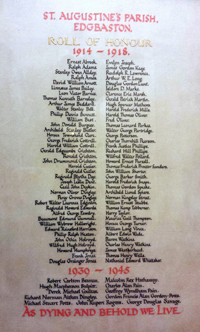 You can discover more about each of the men listed on our War Memorial by reading a guide. We thank Richard Warby for the collation of this document, acknowledging quotations from two published works, "Birmingham Pals" by Terry Carter and "The Worcestershire Regiment in the Great War" by H. FitzM. Stacke. There is also a 'Roll of Honour' sited within the church, listing the names of those who lost their lives in both world wars.